Remodeling is on the upswing, so if you’re one of the millions of folks who’ve got a new dining room space, now is the time to “invest in that nest.” Not only does investing in your home help build equity, but it also gives you the opportunity as a homeowner to feel more comfortable in your living space. So, if you’re ready to retire that outdated French country look, there’s no better time than the present to get in sync with a 21st-century design. With endless color and style options, there’s a perfect look out there just waiting for you to try. Whether you’re tweaking your current dining room or need a fresh new look, we’ve got some great modern dining room furniture and design tips to help you out. Check them out below! What comes to mind when you think about modern design? Some of the most common characteristics of modern design include clean lines, simple designs, muted color palettes (with the exception of a few bold splashes of color), and interesting textures. Shiny surfaces, fluid space design, and creative lighting are also key factors that make up a modern living space. The look of the table will help define your theme, so choose something that is both functional and stylish. There are several key sizes and shapes to select, such as square, rectangle, round or oval. If you’re short on space, choose a round table or a clear table for a more open look. Materials such as glass, metal, or clear acrylic are great options. For a wood table, select one with a removable leaf for extra guests. Seating is a very important part of designing your room so it’s best to try before you buy. A common mistake people make is to choose the chair’s style over comfort. Think about how you’ll feel sitting through a five-course Thanksgiving dinner in upholstered seats versus those uber-sleek metal chairs. Enough said. Also remember to select the right amount of chairs – whether that means for two, four, or 16. There’s nothing worse than limiting your guest list because you didn’t have enough seating. Adding a buffet or sideboard to the dining room is both a functional and fashionable way to boost your modern style. Buy a matching piece to a set, or incorporate a vintage modern piece for an eclectic look. Once you have the essentials, consider adding in a few extras. Check out our suggestions towards the end of the article. Before you do anything, make sure your finances are in tip-top shape before you get attached to any furniture pieces. Whether that means you pay for the set with a store credit card, or pay in cash, sticking with your budget ensures you’ll spend within your means comfortably. Besides, no one wants to have to return their modern dining room set because they can’t afford the monthly payments. The quality of your dining room set should be a top priority, especially the dining room table. A good rule of thumb is to choose a table built to last for at least five to 10 years. A few tried and true stable materials to consider are stainless steel and solid wood. Measuring the space of your dining room is the most important step to take before buying furniture. A common mistake people tend to make is not leaving enough room for foot traffic. Color has the power to make a huge impact on the mood of your dining space, so don’t rush into your decision. If you’re comfortable choosing colorful chairs or upholstery, it’s a versatile way to amp up your look. It’s also an inexpensive way to change the look in the future. Wall color is another great place to express your modern style. Sometimes painting one boldly-colored wall can be more effective than all four. If you’re considering the modern look, there are some textures to choose from that are more fluid with the design. A few key texture details to think about when looking for the right modern set are glossy paint and minimalistic finishes. This communicates a more sophisticated and clean look. Patterns can be either be abstract, colorful expressions or the same image repeated throughout a space. Using a patterned wallpaper or drapery is a great option for introducing a modern dining room look. The purpose of creating dynamic lines in a dining room is to move your eyes throughout the space while bringing balance to any problem areas. Modern lines tend to be clean and simple, so when choosing art, furniture, and accessories remember to avoid anything overly ornate or heavy looking. Go with geometric styles instead. Light is one of the most effective tools to enhance a room. Where natural light can brighten up a space, artificial light can too. It just takes the right modern light fixture to make the room pop! Because light can change the way a color looks on the wall, make sure to paint a good-sized swatch before you commit. Once you have the basic components of a modern dining room, you might want to consider adding in a few extras like art, mirrors, a chandelier, and a rug. Try smaller accent pieces like a cocktail cart, modern curios, or floating shelves. Ready to Make that Modern Style Pop? 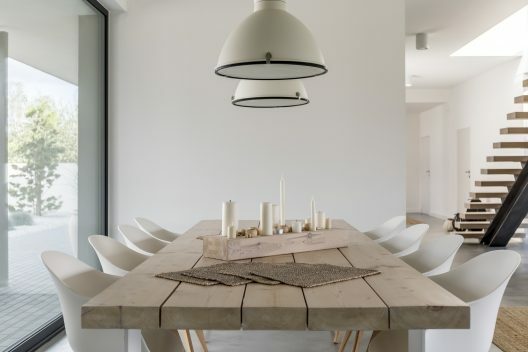 We hope our list helped you in your search for the perfect modern dining room! For more great design tips and trends, check out our most recent blog posts and let us know how we can help! 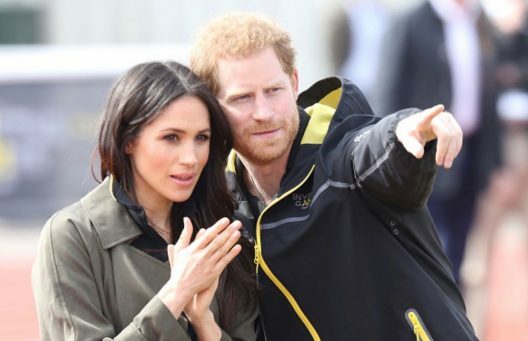 With Prince Harry and Meghan Markle tying the knot and with that, breaking many rules and age-old traditions as well as redefining what royalty in the 21st century really means through their fairy tale love story, it is not surprising that the ultra-modern interior style that’s known for its particular minimalism is getting a royal makeover. Epitomizing exquisite materials that are inspired by regal heritage and combining aesthetic simplicity with intelligent functionality, today’s modern design heavily influenced by extravagant details typically associated with royalty. 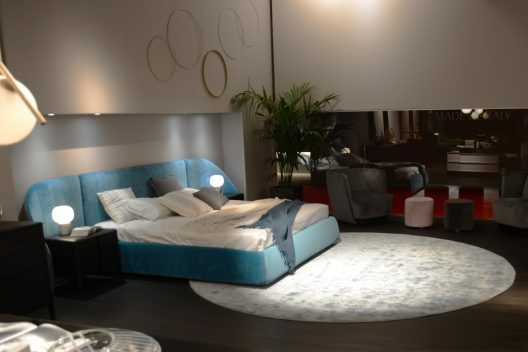 This trend was particularly highlighted at this year’s Salone del Mobile that took place in Milan last month. From velvet upholsteries to exaggerated structures, here’s our favorite example of this growing modern trend. 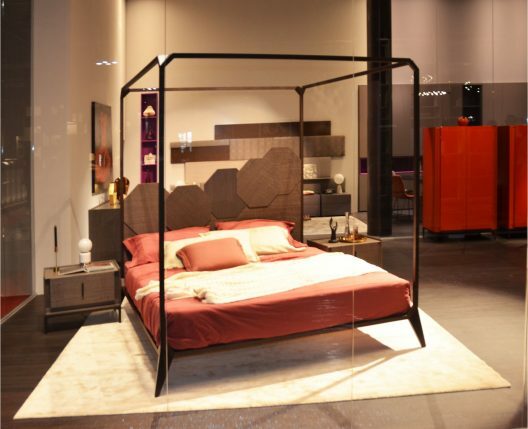 Rossetto showcased two beds that added some extraordinary elements to its already stunning bedroom selection. The Caracalla bed was upholstered in a jewel-toned velvet fabric with extra wide and, curved headboard that’s designed to envelop with cozy refinement. The Sipario bed is the company’s first canopy styled bed that joins the decadence of aristocratic Europe with modern geometry that’s incorporated into its headboard. Spring is here and as they say, “April showers will bring May flowers,” so is the rain. 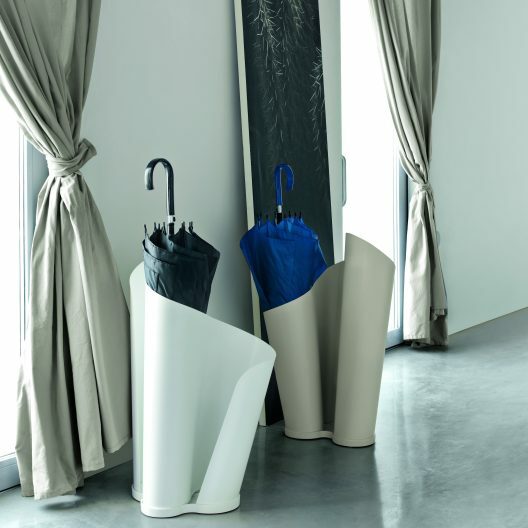 With the season of renewal, and in the spirit of restocking, it is a good time to check on your umbrella stock and perhaps invest into a sleek modern umbrella stand that is sculptural and useful at once. 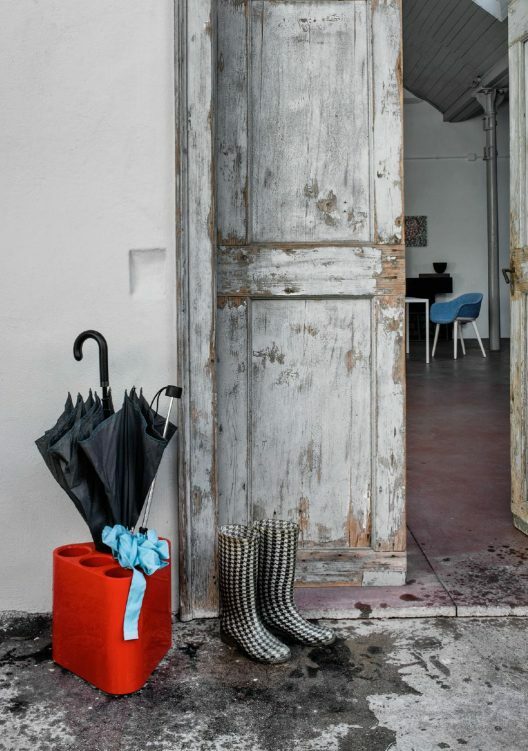 There to add a creative twist to any entryway while preventing dripping rain puddles, check out our top 5 contemporary umbrella stand picks for rainy-day inspiration. 1. Zontik by Karim Rashid for Casamania-Horm is named after the Russian word for umbrella and made from polyethylene in matte white and brown or colored polyethylene in blue, copper, silver and hunter green colors with a clever shape that’s designed to carefully contain the water from wet umbrellas. 2. Narciso by Davide Bozzini for Tonin Casa is first a sculpture and second a functional piece of furniture. Made using a special metal bending procedure that results in a wavy structure, Narciso umbrella stand is available in white, beige, yellow, anthracite and fuchsia colors. 3. Portaobrelli by Gino Colombini for Kartell is a simple yet entirely transcendent design that offers great deal of functionality and elegant appeal. 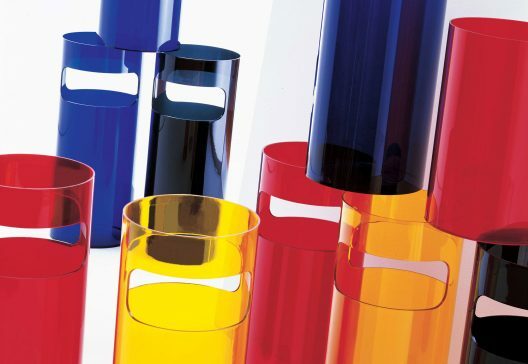 Made of batch dyed or painted plastic, Portaombrelli has a classic cylindrical shape and an array of bright colors that evoke its 1960s origins. 4. 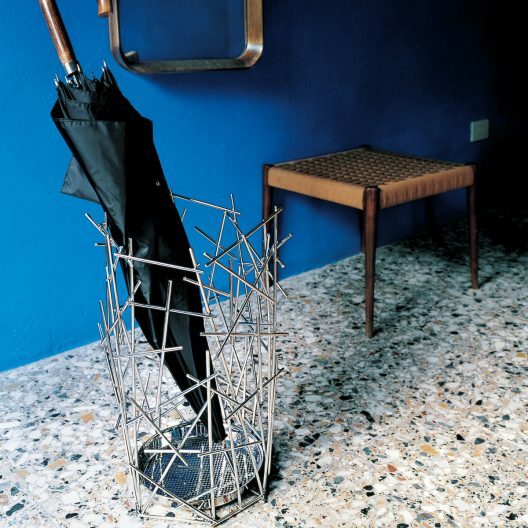 Blow Up Umbrella Stand by Humberto and Fernando Campana for Alessi is part of a larger collection that shares a memorable geometric design reminiscent of jackstraw game. Featuring a polished stainless-steel structure comprised of individual and interconnected stocks, Blow Up umbrella stand gets its name and from a hypothetical explosion that yields its randomized, sculptural façade. 5. Poppins Umbrella Stand by Edward Barber & Jay Osgerby for Magis playfully pays homage and celebrates Mary Poppins infamous arrival and via its design, serves a practical need for umbrella storage. With four shiny colors to choose from, Poppins triangular design allows for corner placements and doubles as a wine holder when not used for umbrellas. Comfort is vital and probably surpasses the design factor when it comes to usability of a dining chair. And yet, comfort is not a forgone conclusion when it’s associated with modern dining chairs in the kitchen or the formal dining space. Especially because many decisions are made with key factor being WHAT the dining chairs look like, rather than HOW comfortable they are. This, in addition to misconceptions related to comfort, creates the need to debunk some of these myths. Myth #1 – The size of the chair is suggestive of its comfort level. It is a myth because a smaller scale dining chair like Filly chair by Bonaldo offers proper back angle, sturdy steel frame and high density, crush-proof padding, with a conveniently removable cover and lots of upholstery choices. Myth #2 – The more padded the chair, the more comfortable it is. Yet another myth which ignores the type of padding used in the construction process which cannot be isolated to a visually test only. 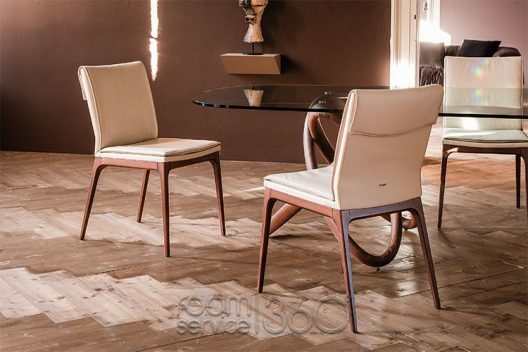 Isabel, Sofia and Tosca dining chairs by Cattelan Italia all share the same seat and back designs albeit different legs and all represent the most comfort instilling dining solutions in modern design. Yet, if compared on how padded they are to heavier looking padded chairs, they will fail the optical comfort assessment. 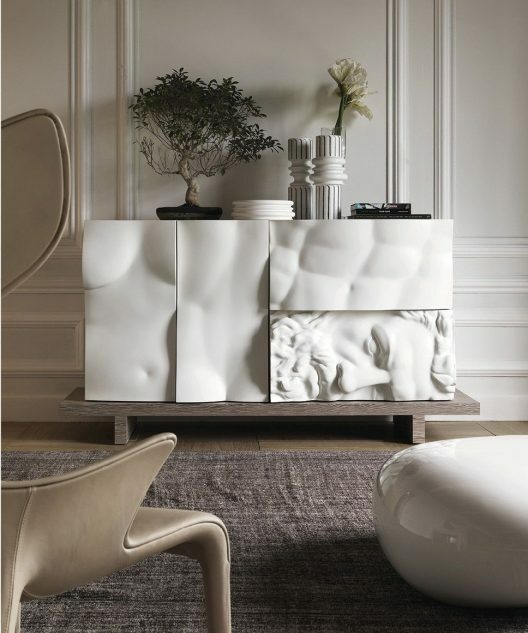 Inspired by the popular Olympian Gods, Hercules who had legendary strength and physique and Aphrodite, the goddess of love and beauty, Ercole e Afrodite cabinet collection by Driade is an extraordinary juxtaposition of mythical figures into modern design. 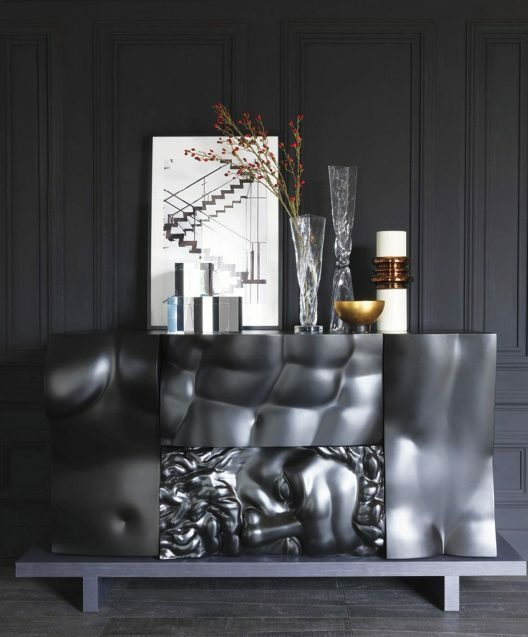 A product of Driade Lab, Ercole e Afrodite is a group of storage containers that are available in either glossy black or matte white lacquer representing anthropomorphic elements that yield the most sensorial exhibition of modern design when joined into a fused sideboard silhouette. It is especially powerful because of the extremes and opposites that it represents; beauty vs. strength, femininity vs. masculinity, classic vs. modern, black vs. white, vertical vs. horizontal, shiny vs matte. It is also a one-of-a-kind piece of functional art that pays homage to the genius of Italian design as well as to the poetic element of historic integration into daily life.